AllegroMedical.com presents The Moist-Dry Heating Pad by Drive Medical. Feel better quickly and easily when you experience the relief delivered by heat therapy with a Moist-Dry Heating Pad from Drive. 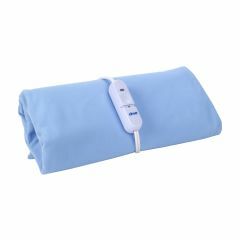 The heating pad soothes minor muscle and joint aches and pains with effective, penetrating heat therapy. With three heat settings and the ability to utilize both dry and moist heat, the pad allows you to choose the therapy best suited to your needs. Choose either the standard or large size for the ideal fit. The self adhesive belt ensures proper placement and the auto-off function ensures safety. Plus, the soft fabric cover is machine-washable for easy care. When you choose a setting will it automatically turn off if the patient falls asleep or for some reason can not turn it off themselves?